World War I began in Europe in the summer of 1914 with major battles between the Central Powers of Germany and Austria-Hungary versus the Triple Alliance of the United Kingdom, France and Russia. The Ottoman Empire (Turkey) joined with the Central Powers and attacked the British at the Suez Canal in January 1915. 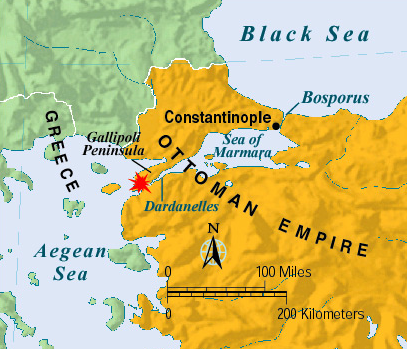 In an attempt to put pressure on Germany and Turkey, Britain sent warships to the Dardanelle Straits in April 1915, planning sail up the narrow, 60-mile-long waterway to shell Constantinople and break through to the Black Sea to relieve German pressure on Russia. Many of the ships were sunk or badly damaged by Turkish shore artillery and naval mines and the rest were forced to retreat. A subsequent amphibious landing of British, French, Australian and New Zealand troops at Gallipoli met with stiff resistance. A long eight month slug-fest ensued with an estimated 250,000 wounded and dead on both sides. 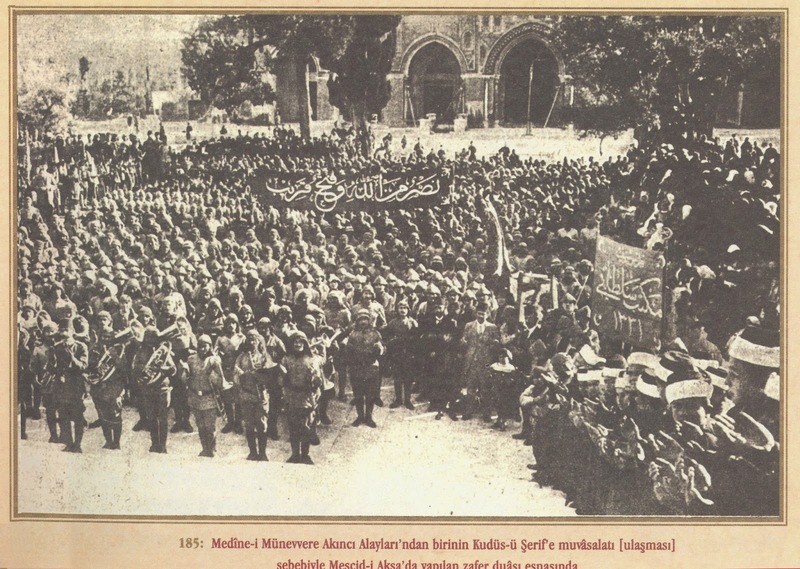 We discovered the picture above in the newly digitized Ottoman Empire Archives with a caption explaining the Turkish troops were heading off to fight on Gallipoli. The photo could explain the next two 1915 photos we found that were missing captions. 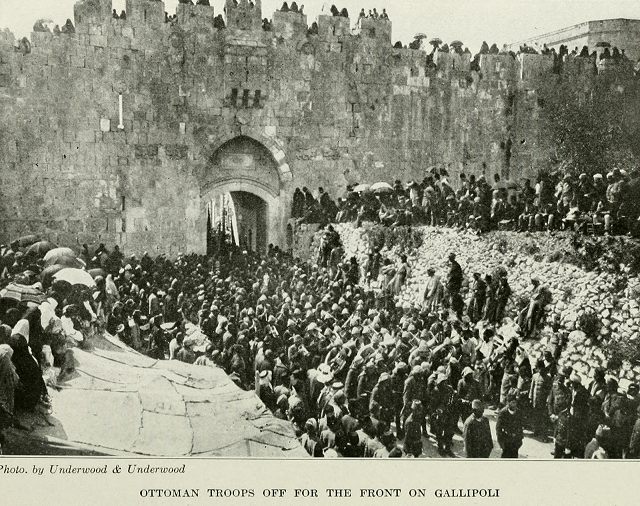 In The Zion Muleteers of Gallipoli, the author Martin Sugarman, wrote, "In March 1915 the Zion Mule Corps became the first regular Jewish fighting force to take active part in a war since the defeat of the Bar Kochba Revolt 2000 years ago. Some of its men later formed the core of what was to become the modern Israeli army." The Jewish corps was formed in British-held Egypt and consisted of local Egyptian Jews, Jewish exiles from Turkish-ruled Palestine, and British officers. 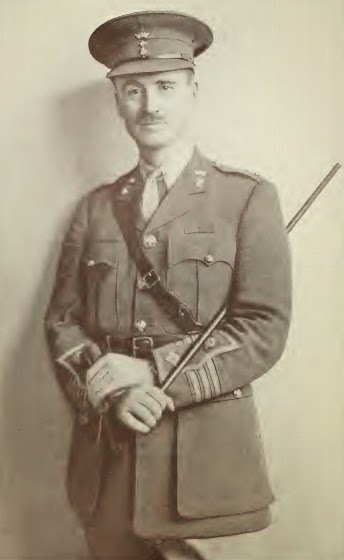 Lieutenant-Colonel John Henry Patterson commanded the unit; officers included Zev Jabotinsky and Yosef Trumpledor who were expelled from Palestine. View more on the Jewish unit here. The new Corps, Sugarman related, "was officially designated a Colonial Corps of the Egyptian Expeditionary Force and was to include a maximum of 737 men.... They were allocated 20 horses for officers and NCOs and 750 pack mules." The Corps' mission was to take supplies, such as water and ammunition, to the fighting forces at the Gallipoli front. Often they were under heavy Turkish fire and bombardment. Sugarman revealed, "Their courage even reached the ears of the Turkish Commander in Palestine, Djemal Pasha, who was indignant that a unit of Palestinian Jews were fighting against the Turks in Gallipoli. 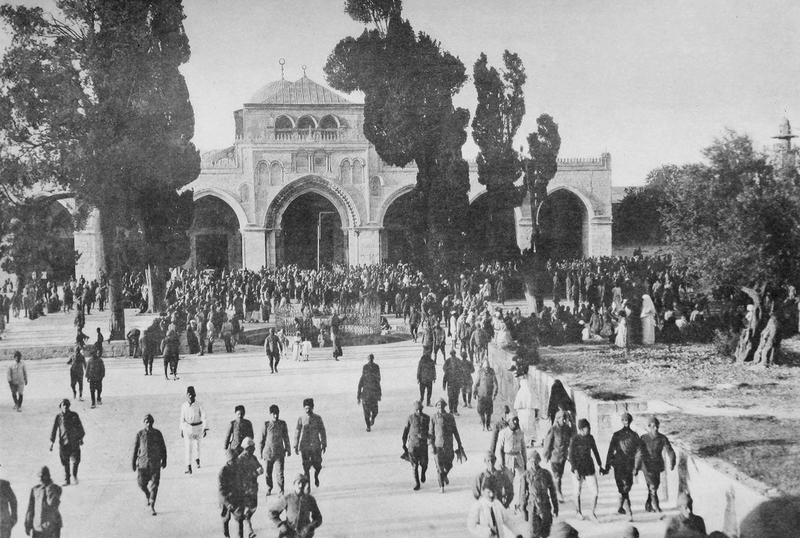 To placate the Turkish authorities" Sugarman continued, "the Jewish Community in Palestine proclaimed it wrong to fight for the British, and even organized a protest against them in Jerusalem." The Gallipoli War was an utter failure for the British. All British and ANZAC troops were withdrawn in December 1915. The disaster at Gallipoli stained the reputation of the First Lord of the Admiralty, Winston Churchill, who resigned from government. But the Corps excited the Jewish world, and while the Zion Mule Corps was but a colonial, auxiliary, supposedly non-combat unit, it served as the inspiration and training ground for the Jewish Legion, Haganah, and the Israel Defense Forces. In the first picture of soldiers in front of Al-Aqsa, actually the Lion's Gate is nowehre "near" in any proportional sense. In fact, it is outside the compound completely, about 80-100 meters north of the northern wall of the Temple Mount compound.